vCard is an professional & amazing vcard Template, a beautiful portfolio with color change option. It has nice resume and contact information section with Google map. You can show your online card to your customer, employer and friends while interview by phone or tablet. 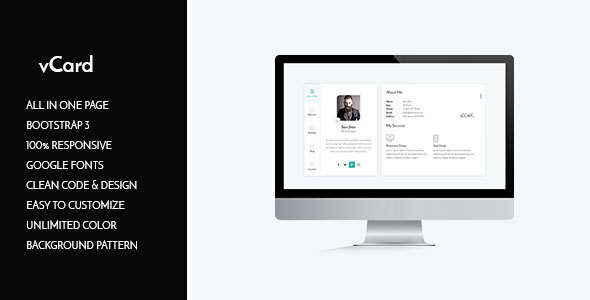 vCard is fully responsive template. vCard has 5 useful section.About me,Resume,Portfolio,Blog and contact section.You can your online card that have your name,profession,education background,work experience,your latest blog, and your contact address. vCard has awesome About Me section. You can show your details,skill and what kind of service provided.After that you can also show your language skill,your achievement and your client’s logo. vCard has Unique Resume section. You can include your education background,your experience history and testimonial on this section.Normally your client or your buyer want to see your work experience your education background and other client or buyer what say about you. So you can show your everything which think your client or buyer want to know about you. vCard has Clean Portfolio section. A most important part is show your portfolio to your client or buyer.You can attached your creative portfolio on this section.In this section we provide you lightbox gallery. vCard has carousel Blog section. In this template you can add your latest blog.Its a carousel blog section so can add unlimited blog item in this section. vCard has a stunning contact section. We provide you a contact section.It has google map.You located your office.We provide contact form also.We hope its helpful and full fill your all kind of requirements.